Runners, friends, and families flocked to the Westfield Plaza Camino Real parking lot today to pick up numbers, t-shirts, gift bags, and load up on socks, energy bars, and self-massaging devices in the Carlsbad Marathon Health and Fitness Expo. We rolled by the big white tent to see what was going on the day before the stampede. Click the link for all the photos, and click the photos to see them at full size. 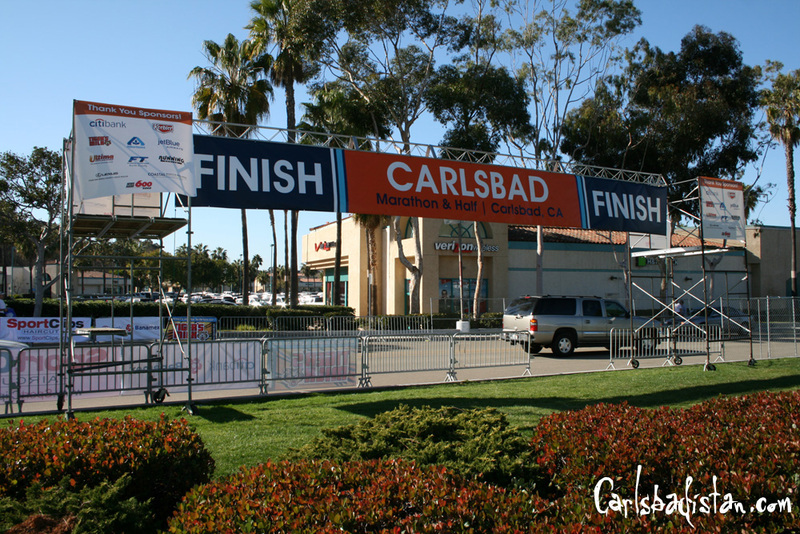 This year The Rotary Clubs of Carlsbad is presenting its 25th Annual Oktoberfest at Holiday Park in Carlsbad on Saturday October 6th from 1 to 10 PM. The family event features German food, German music, dancing, and a host of children’s activities, including a pumpkin-decorating contest, facing painting, clowns, and much more. The pumpkin-decorating contest is for children 5-15 years old. . . Roger and the Villagers will play its traditional brand of polka music, including the beloved “Chicken Dance, from 5 to 10 p.m. . . . A German dinner will be served from 1 to 8 p.m. . . . Tickets are $10. Oh, and there will also be beer. . . lots of beer. Did we mention that? For more info click the link below. 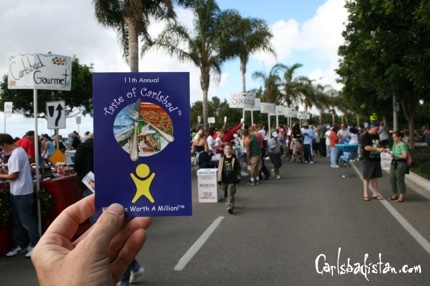 [Click HERE for all the photos] This year the Carlsbad Education Foundation’s 11th Annual Taste of Carlsbad joined up with Art Splash for a combined event that made us think was a perfect Saturday afternoon excursion in Carlsbadistan. And from the packed isles and lines at the booths (especially Darios) we don’t think we were alone. Taste of Carlsbad features exemplary cuisine from twenty Carlsbad restaurants. One $20 donation to the CEF buys visitors a card good for samples at 15 of the restaurants. Before you jump into the photos here were our favorites: El Puerto Mexican Food (next to the Golden Tee in the Albertson’s parking lot), The El Camino Real Grille (by the people who created Savory), Knock Out Pizza (in the Village), Lola’s, and the Tri-City Medical Center’s Cafeteria. [Click HERE for all the photos] Today around noon the “big winter storm” that had been forecasted began loading up some clouds off shore with close to six water spouts. 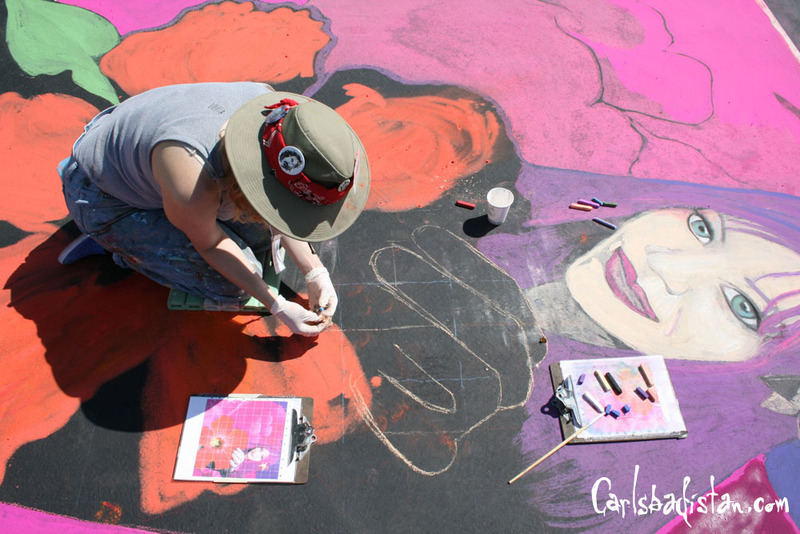 The clouds moved on shore just in time for Carlsbad’s Art Splash on Armada Drive behind the Flower Fields. 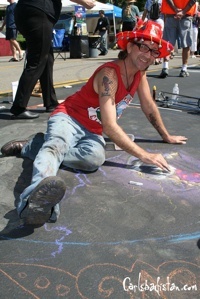 Though it rained for about 20 minutes, it was not enough to slow any of the dedicated chalk artists . We lost a little in the rain, but it wasn’t bad, ” said Eugenia Bizzaro as she and her husband Blane worked under the bright sunlight. She and Blane (Bizzaro Creations) are artists who take this transitory art form very seriously. Several thousand people enjoyed the first day of the two day event. 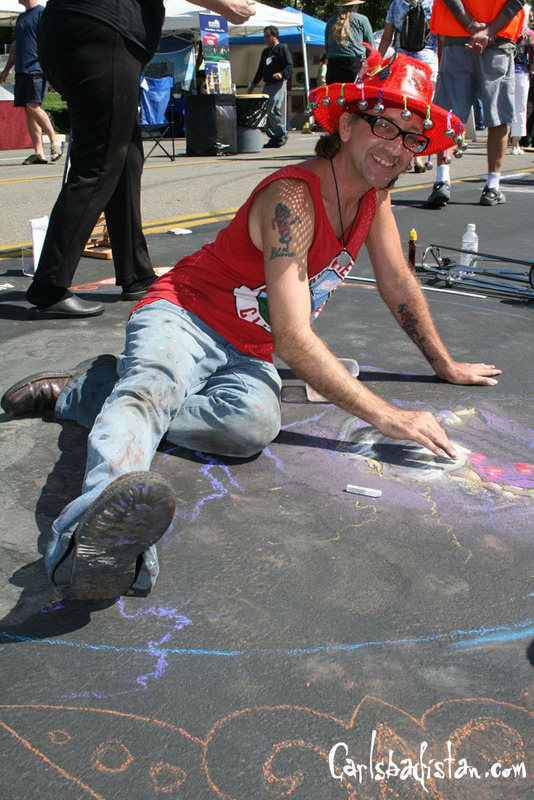 While there wasn’t that much chalk art to see today, there were booths showing art of all mediums and style. For the completed chalk art be sure to check it out tomorrow. Follow the link for all the photos. 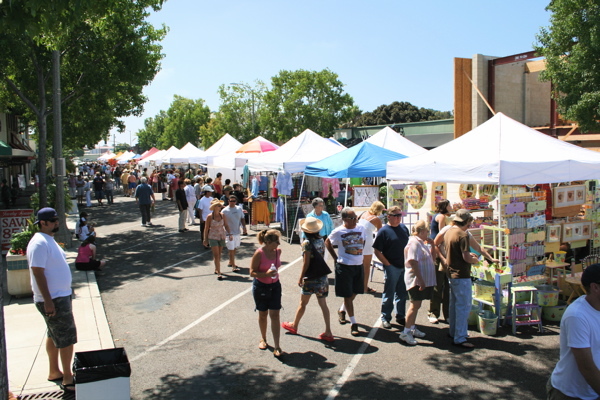 On Friday night at Jazz In The Park we were complaining about the skies being overcast, but Sunday August 12, 2007 turned into a perfect Carlsbad Summer Day, just in time for the 2007 Art in the Village Street Fair. Thousands turned out to walk the streets of The Village checking out an amazing collection of art, crafts, and snacks from more than 200 vendors. Click the link below for all the photos. 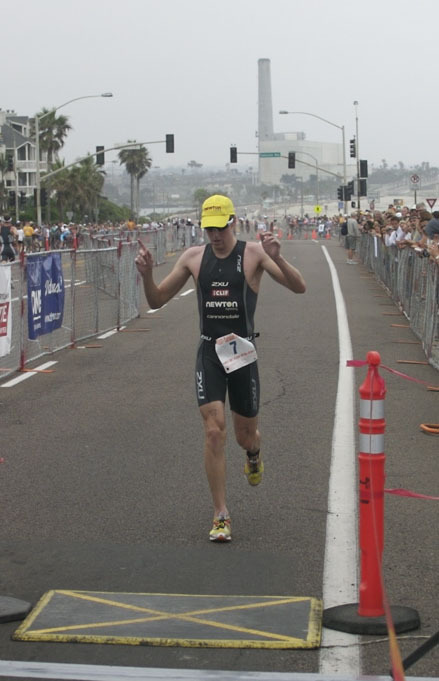 Today’s Carlsbad Triathlon, which basically took over all of Carlsbadistan for the day, was won by a Canadian. Yes, blame Canada. Michael Simpson of Vancouver, B.C. 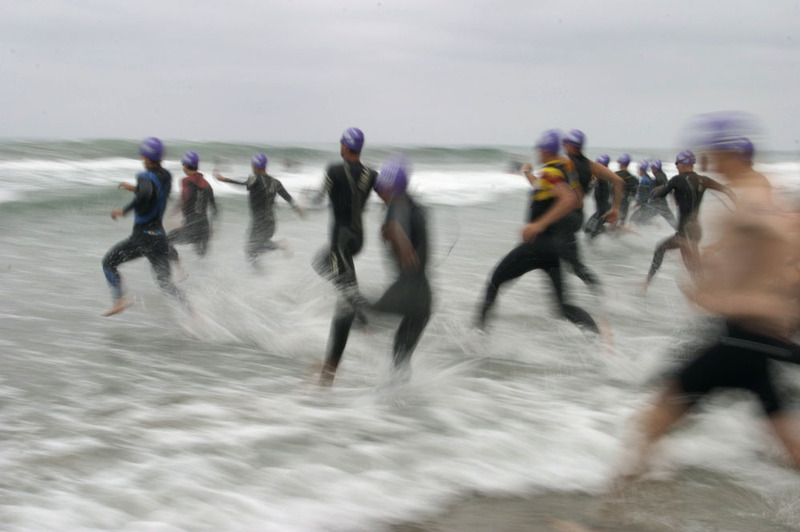 Canada took the swim, bike, run with an unofficial time of 1:07:03, a full two minutes faster than last year’s time set by Luke Bell. 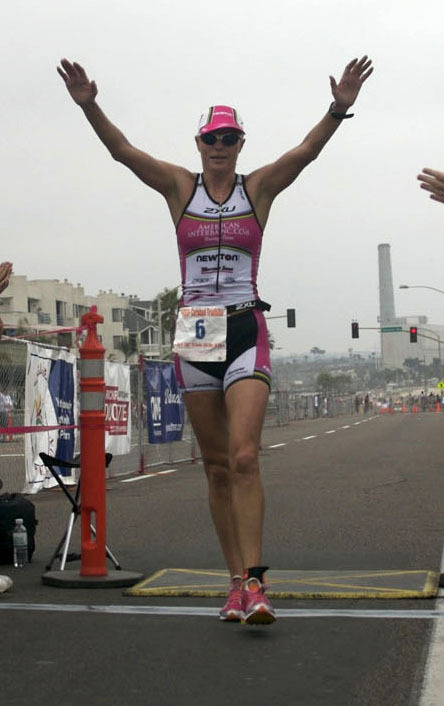 Click the continue for more photos from the day (click the images to see them larger) and elite unofficial results. 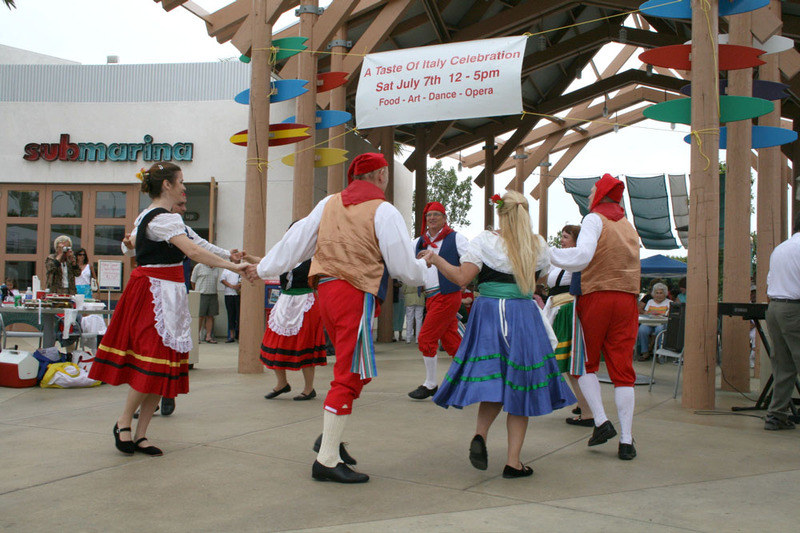 The Islands @ Carlsbad at the corner of College and Faraday transformed into fair Verona today from noon to 5 PM as the Order Sons of Italy in America (La Costa Dei Fiori Lodge) of Encinitas brought their Festa Italiana to Carlsbad. Under overcast skies, Sicilian folk dancers entertained the crowd while vendors sold cookies, wine, and even promoted treatments at a day spa. There was also instrumental music, arts and crafts, European art and photography, and most importantly information about bocce ball. Organizers were happy with the the turn out. “We believe that over the course of the day today we had a couple thousand people come through,” said Joe Zazzaro, vice president of the La Costa Dei Fiori Lodge. We arrived late and are bummed that we didn’t get to see more of the event. We’re not going to miss it next year, and you shouldn’t either. Click continue for more photos. When our friends Cec and Katie sent us an invitation to their neighborhood “4th of July Parade,” we honestly imagined a couple strollers with flags taped on and Cec in a Uncle Sam costume. We thought we’d stroll the neighborhood waving to strangers and write it off as performance art. 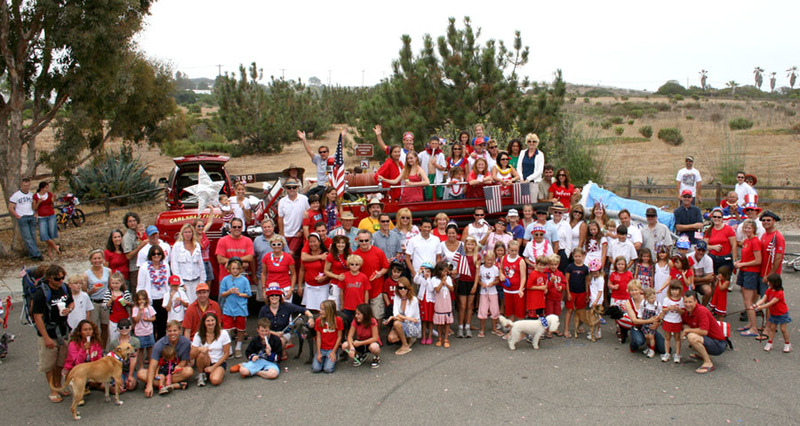 When we arrived at Terramar at about 11:20, however, what we found was a completely decorated neighborhood and a parade lead by a red Lincoln Continental convertible with floats, people in costumes, and Captain Mike Davis of the Carlsbad Fire Department behind the wheel of Carlsbad’s old-time fire truck. 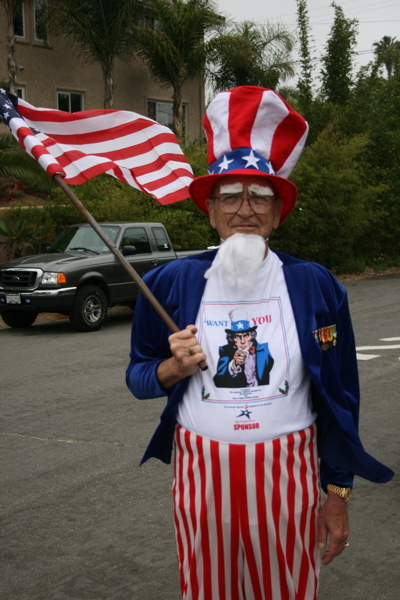 And yes, there was even an Uncle Sam in the march. 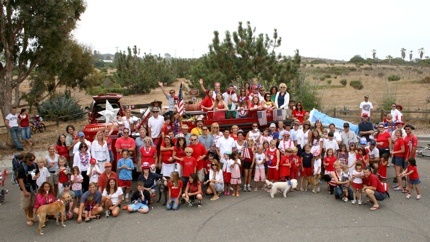 We were overwhelmed by the sense of community, neighborhood pride, and America love. It made us damn proud to be Carlsbadistanians. Follow the jump for more photos (click them to see larger).